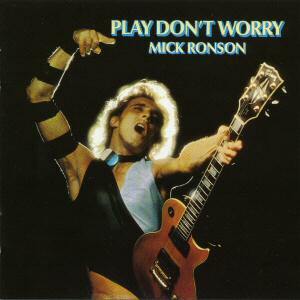 Mick Ronson CD: "Play Don't Worry"
Snapper Music Label/Dead Quick Music SMMCD 504. This is Mick's second album, from 1975. I quite like it, although there are many fans who prefer Slaughter On 10th Avenue. It died a death when it was originally released, and for many years was unavailable. It was issued as part of the Only After Dark 2-CD set (now deleted), and has now surfaced as an individual CD, complete with original packaging. This CD includes all the original bonus tracks from the earlier CD, together with some songs Mick demoed with Bob Dylan's Rolling Thunder band in 1976. They sound incomplete, but will interest the completist. Note that Life On Mars is a Roscoe West composition (not Ronson as the sleeve notes would have you believe), and not a re-recording of the Bowie track from Hunky Dory. Packaging is excellent, as is the sound quality.